“This message was kept secret for centuries and generations past, but now it has been revealed to God’s people. For God wanted them to know that the riches and glory of Christ are for you Gentiles, too. And this is the secret: Christ lives in you. This gives you assurance of sharing his glory”–Colossians 1:26-27, NLT. “Technology has changed the way we live, but it cannot change who we are. We still feel the same fears and cherish the same hopes as our parents and grandparents did . . . . Nor has God’s nature changed. Jesus is the same yesterday, today, and forever (Hebrews 13:8). 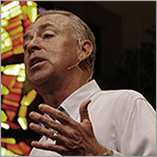 The Bible is still relevant because the God it reveals is still relevant to our deepest needs and desires”–Jim Denison. “Having a full inheritance is exactly what it means to be spiritually adopted into God’s wonderful family. You have been made a joint heir with Jesus Christ. This means you are fully accepted into the beloved (Ephesians 1:6). Because you are a joint heir with the Lord Jesus Christ, you have access to the Father just as He does. Our Heavenly Father’s provisions are not limited. Our Father is not only desirous of meeting our needs, but He is also a King who is able to meet our needs. What an incredible thought–that we are an heir of God. What does all this mean for you today? It means that my Father is King, I am a King’s kid, and I have constant access to the King of Kings”–Ron Herrod. “First off, I’d like to thank God for changing my life. It let me realize what life is really all about. Basketball is just a platform in order for me to inspire people and I realize that”–NBA MVP Kevin Durant. “Therefore, if anyone is in Christ, there is a new creation; old things have passed away, and look, new things have come” (2 Corinthians 5:17, HCSB).